Dexim DCA256B-W Visible Green Smart Charger for iPod/iPhone/iPad. The Dexim Visible Green Smart Charger and its automatic shut-off feature helps you reduce unnecessary standby power when your device is not in use up to 85% with their integrated green technology. 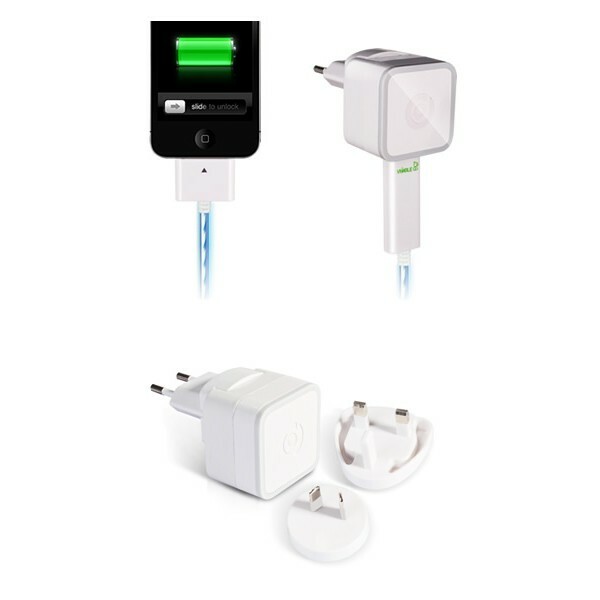 Simply plug the charger into a wall socket to save power without unplugging your devices. You can see how fast your device is charging and how much energy you are saving with EL lights flowing through the cord. The light flowing through the cord at a fast pace means your battery charging level is at up to 65 percent. After 65 percent the light will flow at a slower speed, and once fully charged the light will shut off. The Dexim Visible Green Charger will save you money, energy and our earth.